Syedna Qutbuddin has stated that Syedna Burhanuddin proclaimed Nass on him in private 50 years ago right before he publicly declared his appointment as Mazoon. Syedna Burhanuddin also said at that time that it will become known in the future (jiware zahir thaase tiwaare thaase). Nass in private from the Dai to his Mansoos without any other witnesses is valid. Syedna Taher Saifuddin explains in his risalat 1363H (p.144), on the authority of Syedi Ameenji b. Jalaal and Syedna Daud b. Qutubshah, the private Nass performed by the 7th Dai Syedna Ahmad bin Mubarak on 8th Dai Syedna Husain bin Ali. After Syedna Ahmad’s wafat, his successor the Syedna Husain himself declared that he had been appointed by his predecessor in private without any witnesses, for reasons pertaining to the welfare of Dawat. Syedna Husain also asserted that there was no one at par with him in ‘ilm and knowledge. He presented a book of haqiqat he had written (kitab al-Īḍāḥ wa l-Bayān) and challenged anyone to produce anything similar. The excerpt relating to this account with translation is in the documentary evidence section below. Syedna Qutbuddin’s ‘ilm and knowledge of Fatimid theology is unparalleled and has been attested to by statements by Syedna Taher Saifuddin and Syedna Mohammed Burhanuddin. According to our doctrine, once a successor is designated, that designation can never change and will never change. Nass is done by Imam-uz-zamaan’s ilhaam, and that ilhaam can never be wrong. The Imam according to our faith is infallible, ma’sum, and his Dai is kal-ma’sum and cannot make a mistake in the appointment of his successor. If one allows for the possibility that Nass was erroneous the first time, then what is to say that it is not erroneous the second time around? If we allow this possibility then we bring into question not only this Nass but all the preceding designations. There is not a single instance recorded or related in the 900 year history of Dawat al-Satr in which a successor was appointed and then retracted. As Syedna Burhanuddin appointed Syedna Qutbuddin 50 years ago, according to our doctrine and belief it is impossible that he would change this designation for whatever reason. The rutba of Mazoon is the highest rutba in the dawat of satr after the Dai al-Mutlaq. The rutba is fully named Mazoon al-Mutlaq because of the high platform that it shares with the Dai al-Mutlaq. It is a rutba for which we give an oath of allegiance in the misaaq alongside the Dai. See further below for source texts and translations of the below bayans. Mazoon is Mazoon Mutlaq (bayan of Imam Mu’izz’bab, Syedna Jafar b. Mansur al-Yaman): The Dai only appoints as Mazoon one who is a true embodiment of imaan and one who he trusts implicitly. In the Arabic text of the misaaq and in the bayan from the time of Imam Mu’izz by his bab-ul-abwaab Syedna Ja’far b. Mansur al-yaman, the Mazoon is referred to as Mazoon Mutlaq. Just as Dai is Mutlaq, Mazoon Mutlaq means that the one in that rank has full and absolute raza. Such raza is only given if the individual is absolutely trustworthy. Mazoon is the highest rutba after Dai and his ta’at is compulsory (bayan of Syedi Qazi Khan): The Mazoon is the second highest in the three rutbas of Dawat by whom the Imam is said to be present. Obedience to these rutbas is obligatory in the absence of the Imam. Syedi Qazi Khan equates the ta’at and obedience of the rutbas of Dai, his Mazoon and his Mukasir to the ta’at of the three rutbas referred to in the Qur’anic verse (4:59) ‘Obey Allah, obey his rasul, and the Imams (‘uli l-amr). Ref. Syedi Qazi Khan, Asrar al-Nahw – 5.1.4.4b). “Hudud muzdawija”: Dai and Mazoon are paired together in Dawat theology (bayan of Syedna Qazi Noman): Out of the three rutbas, the Dai and the Mazoon have a special status and are continuously paired together as hudud muzdawija (pairs of hudud), just as the Nabi and his Wasi and the Imam and his Hujjat. This pairing is attested in numerous Dawat sources in various contexts, especially by Syedna Qadi al-Nu’man. Dai and Mazoon are mumineen’s ruhani bawa and maa (bayan of Syedna Hatim bin Ibrahim): The 3rd Dai Syedna Hatim b. Ibrahim states clearly in Tanbihul Ghafileen that Dai and his Mazoon are the spiritual father and mother of the children of Dawat, just as the Nabiyy and his Wasiyy and the Imam and his Hujjat. Dai and Mazoon are symbolised in the Kalematus Shahadat and in the compulsory prayers (bayan of Syedna Mohammed b. Taher): Similarly, as attested by Syedna Muhammad b. Taher in Majmu’ al-Tarbiya, the Dai and Mazoon are paired as representing two of the four parts of la ilaha illa allah ([“link to excerpt”] Ref. Syedna Muhammad b. Taher, Mamu’ – 5.1.4.4e and 5.1.4.4f). The Dai and Mazoon, also according to Syedna Muhammad b. Taher, represent two of the five compulsory prayers (Note- that Syedna Muhammad b. Taher, who is considered an authority of ‘ilm in Fatemi Dawat was himself the Mazoon of Syedna Hatim. The Mazoon in every day and age should be considered, after the Dai, the highest authority). Dai and Mazoon are two equal parts of Allah Taala’s Rehmat (bayan of Syedna Taher Saifuddin): Syedna Taher Saifuddin in many bayans elaborated the meaning of the two parts of Allah TA’s rehmat referred to in the Qur’anic verse (57:28) ‘He [Allah Taala] shall give you two equal parts of his rehmat’ (yu’tikum kiflayn min rahmatihi). He said that the two parts are the Nabi and his Wasi, the Imam and his Hujjat and in the time of seclusion, the Dai and his Mazoon. Those whom Allah and his wali Imam uz Zaman have paired, none can break apart! Mazoon’s absolute truthfulness: Syedna Khuzaima Qutbuddin was Syedna Mohammed Burhanuddin’s Mazoon until his wafat. No one can dispute this. Mazoon’s aala shaan is attested in Dawat kitaabo. Therefore, you must accept that what Syedi Mazoon Saheb is saying about Nass is the truth (and that what shehzadas are claiming counter to that is fabricated). No Mazoon in 900 years of Dawat al-Satr history has ever gone against the wishes of the Dai. On the other hand, many sons have made false claims which led to schisms (for eg. the Dai claimants of the Sulaymanis and Alyas). Following Syedna Burhanuddin, Syedna Qutbuddin possessed the highest shaan in Dawat in rank, in imaan, ilm, akhlaaq, taqwa, riyazat, bandagi, sabar, siyasat, guidance, vision, wisdom, fairness, integrity, sincerity, khidmat, compassion, caring for mumineen’s well-being. Balance. Eg. wa’azo and bayaano, dealings with complicated Dawat issues in past (eg. Udaipur), Dawat ni khidmat ma jaanfishani, right guidance of hundreds of individual mumineen, founding and supervision of clean charities such as Zahra Hasanaat and QJSP (Qutbi Jubilee Scholarship Program). Conclusion: Syedna Qutbuddin is the rightful Dai and Syedna Burhanuddin’s rightful Mazoon and Mansoos. Syedna Qutbuddin’s supporters are with Syedna Mohammad Burhanuddin, and he is with us. We are mumineen, true followers of Syedna Mohammad Burhanuddin, and true adherents to the misaaq, fulfilling our qasam of walayat to Dai Mazoon Mukasir. The name, in spirit, in truth, in haqq, Syedna Mohammad Burhanuddin was and is with us, and we are his true followers. Syedna Qutbuddin is revealing Syedna Burhanuddin’s Nass on him for khidmat of Dawat, not for any personal gain. It is his duty at this time to make public Syedna Burhanuddin’s Nass upon him. Syedna Qutbuddin’s motive in making this public despite danger to his person and family is Imam uz Zaman AS’ khidmat and carrying out Syedna Burhanuddin’s farmaan. His goal is najaat and salvation of Mumineen’s and the survival of Dawat al-Haqq. Bi ilhamillahi wa ilhami waliyyihi, izan na rutba ma ahabbul asmaa’i ila Syedna Taher Saifuddin, al-waladul ahabb, al-waladaul ahabb, al-waladul ahabb, Khuzaima bhaisaheb Qutbuddin ne qaa’im karu chu, je rutba ma mein hato ye rutba ma bhai ne qaa’im karu chu. 1.Syedna Burhanuddin: “my beloved son”—Prefacing Syedna Qutbuddin’s name, Syedna Burhanuddin said three times over, “my beloved son.” The term “son” has great significance in the Dawoodi Bohra Fatimi-Tayyibi theology, for it denotes the relationship between a Dai and his successor; in the same way as a father produces and raises his son to take his place in this world, so the Dai prepares his successor to take his place in the world of religion. The kitab the second Dai Syedna Ibrahim wrote for his successor is named ‘kanzul walad’ (A son’s [walad] treasure). Why else would Syedna Burhanuddin call his brother his son, and that too three times? 2.Syedna Burhanuddin: “The name Syedna Taher Saifuddin loved best”—Syedna Burhanuddin also prefaced Syedna Qutbuddin’s name with the descriptive phrase “the name Syedna Taher Saifuddin loved best.” He thereby alluded to the fact that his appointment of Syedna Qutbuddin to the position of Mazoon and Mansoos was the articulation of the wishes of his predecessor Syedna Taher Saifuddin. 3.Syedna Burhanuddin: “I appoint him to the position (rutba) that I was in.”— What was Syedna Burhanuddin’s position? He was Syedna Taher Saifuddin’s Mazoon and Mansoos. This statement is testament to the fact that Syedna had both Mazoon and Mansoos in mind, that he wanted to allude to the succession, because otherwise, since he had already mentioned that Syedna Qutbuddin was being appointed to the rutba of Mazoon, the statement would be redundant. 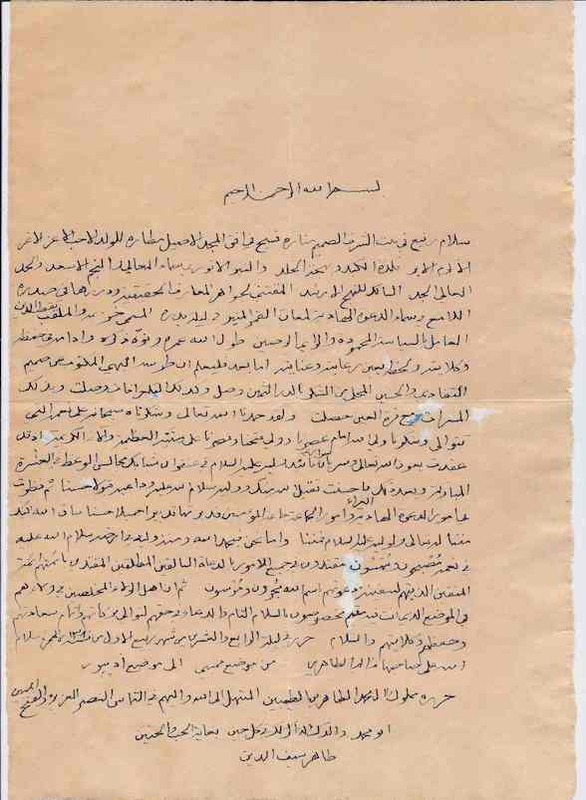 Syedna Burhanuddin’s appointment of Syedna Qutbuddin as Mazoon and Mansoos paralleled Syedna Taher Saifuddin’s appointment of Syedna Burhanuddin (at the young age of 19) as Mazoon and Mansoos. This was the position that Syedna Burhanuddin had held for more than 30 years during the Dai-ship of his father Syedna Taher Saifuddin,and this was the position to which he was appointing Syedna Qutbuddin. 4.Syedna’s Burhanuddin’s instruction: Qadambosi of Mazoon-e-Dawat by his side after safaqat – After the sermon and misaaq were over, Syedna took the personal oath of allegiance ‘safaqat/bay’at’ of all those present. For this he moved from his high seat, takht, at the centre of the masjid, to the mihrab at the front of the masjid.. He sat on the gaadi on one side of the mihrab and took ‘safaqat’. He instructed his newly appointed Mazoon, and also Mansoos, to sit on the other side of the qibla, and he further instructed all the people to offer qadambosi to Syedna Qutbuddin. 6.Syedna Burhanuddin: “We both thank God” – At Saifee Mahal, Syedna Burhanuddin asked Syedna Qutbuddin to accompany him to his private apartments. Just Syedna Burhanuddin and Syedna Qutbuddin were present, and Syedna Qutbuddin did sajda of shukr and shukr araz to Syedna Burhanuddin. Syedna Burhanuddin responded, “ja’alanallaho min-ash-shaakireena li-aala’ihi” (May Allah taala place us among those who give thanks for his benefactions.) Syedna Burhanuddin used the collective “us”, recounting the benefaction that Allah and his Dai Syedna Taher Saifuddin had bestowed on both brothers, Syedna Burhanuddin and Syedna Qutbuddin. 7.Gift of Syedna Taher Saifuddin’s Ring –Earlier in the day before the public appointment as Mazoon, Syedna Burhanuddin gifted Syedna Qutbuddin a ruby ring which he placed on his finger, saying : “Our revered father’s wore this ring, he gave it to me at the time at which he appointed me, I wore it and I give it to you Brother as I appoint you.” In our tradition, this action also indicates the succession of the rutba of Dai, from Syedna Taher Saifuddin, to Syedna Mohammad Burhanuddin, to Syedna Qutbuddin. By contextualizing his gifting of the ring in the manner that he did, Syedna Burhanuddin indicated that Syedna Qutbuddin was his Mazoon and Mansoos. 8.“talvaaro chali jaate”—Muqaddas Mukasirsaheb Saleh bhaisaheb Safiyuddin yeh Syedna Burhanuddin ne araz keedi keh “kem aap yeh Syedi Mazoon Saheb ne Mazoon banaaya tej waqat Nass bhi zaahir na kari didhi?” Syedna Burhanuddin replied “talvaaro chali jaate” – this shows that certain key people knew about Syedna Burhanuddin’s Nass on Syedna Qutbuddin, and it explains why Syedna Burhanuddin did not make the Nass public. This statement shows that Syedna thus knew exactly what impact the manner of his appointment of Syedna Qutbuddin had had on people. Even though Syedna Burhanuddin had not yet publicly declared Syedna Qutbuddin as his successor, people already believed in their hearts that the appointment was much more than the appointment of a Mazoon; it was also the appointment of a Mansoos. Syedna Burhanuddin’s actions and words, added to what people had already seen of Syedna Taher Saifuddin’s nazarat on Syedna Qutbuddin, created a large impact on the Shehzadas, the Ulama of Dawat, senior khidmatguzaro and mumineen. Their individual and collective actions and words reveal clearly that they believed that in addition to his appointment as Mazoon, Syedna Qutbuddin was also Maulana Burhanuddin’s Mansoos. Beginning at the time of the appointment, the, shehzadas, ulama and many mumineen offered sajda to Syedna Qutbuddin when doing salam and in majlises. For three decades (until the fabricated Africa episode), Shehzada Qaid Johar Bhaisaheb and Shehzada Mufaddal Bhaisaheb also offered sajda to Syedna Qutbuddin. Many—including Shehzada Mufaddal bhaisaheb again and Shehzada Mohammad-ul-Baqir bhaisaheb—wrote letters addressing Syedi Mazoon Saheb as “Maula,” and describing him with words used in Dawat for the Dai and the Dai-in-waiting. Several ulama—including Shaikh Ibrahim Yamani who was the senior khidmatguzar, “Diwan,” to Syedna Taher Saifuddin and Syedna Mohammad Burhanuddin—wrote qasidas in Syedna Qutbuddin’s praise, in which they addressed him with words used in Dawat for the Dai and the Dai-in-waiting. Syedna Burhanuddin’s own shehzadas, including Mufaddal Bhaisaheb and Qaid Johar Bhaisaheb, used to do sajda for Syedna Qutbuddin in the presence of Syedna Burhanuddin for three decades. This continued until the fabricated Africa incident in which when the shehzadas maligned Syedna Qutbuddin; they stopped doing sajda to him themselves, and stopped mumineen from doing so. Syedna Burhanuddin: Syedna Taher Saifuddin “prepared the soul”of Syedna Burhanuddin and Syedna Qutbuddin: Syedna Burhanuddin continued to mention to Syedna Qutbuddin privately, and indicate in different actions and statements publicly, that he had appointed him as his Mansoos. In one bayaan in Colombo Ashara 1390H (1970) about 5 years after Syedna Taher Saifuddin’s demise, Syedna Burhanuddin said “Syedna Taher Saifuddin ye ghana nufoos (jaano) ne tayyaar kidha, maro nafs bhi Bawajisaheb ye tayyaar kidho, Mazoon-ud-Dawat-il-Gharra Bhai Khuzaima bhaisaheb Qutbuddin no nafs bhi Bawajisaheb ye tayyaar kidho.” (My father has prepared my nafs (soul), and has also prepared Mazoon e Dawat Khuzaima bhaisaheb Qutbuddin’s nafs [for this position]. [Note that ‘preparing a nafs’ refers in Dawat doctrine to training one’s successor]. Syedna Burhanuddin during Eidul Adha bethak: I am going, but I am leaving my brother Khuzaima bhai in your midst: On Eidul Adha, three or four years ago, Syedna Burhanuddin held Eid ul Adha majlis and qadambosi bethak on the second floor hall of Saify Mahal. As there were many mumineen still left who had not done qadambosi and it was getting late, Syedna called for the microphone. He gestured everyone in front of him to sit. As there was a murmur in the crowd because everyone realized Maulana was leaving, Syedna said ‘mein je kahu chu te suno’ (listen to what I am saying). He then said ‘namaz no waqat thai gayo che, mein jaaw chu, bhai Khuzaima bhai ne yaha muki ne jaaw chu, tamay ehne salaam karo’ (namaz time has come, I am leaving, I am leaving here my brother bhai Khuzaima bhai; you offer salaam to him). Syedna Burhanuddin’s Mazoon for over 50 years: On 17th Shaban 1434H Syedna Qutbuddin became the only Mazoon in the history of Dawat to serve a single Dai for fifty years. Despite many attempts by those exploiting Syedna’s trust over the years – especially shehzada Mufaddal bhaisaheb – Syedna Burhanuddin maintained without fail, in every misaq and every majlis, that Syedna Qutbuddin was his Mazoon. On Syedna’s 100th Milad, Syedi Mazoon Saheb was the only individual whom Syedna Burhanuddin granted the sharaf of an individual ziyafat. In this ziyafat he did doa for Syedi Mazoon Saheb ‘khuda ghani barakat aapay – ghani barakat aapay, duniya aney aakherat ma sa’aadat aapay…’. Despite all efforts by the anti-Qutbuddin group to the contrary, the trust that Syedna Burhanuddin had in Syedna Qutbuddin remained. The ‘alaamat – signature line – that Syedna Taher Saifuddin assigned to Syedna Qutbuddin after haddiyyat clearly indicates what Syedna Taher Saifudin foresaw. It is customary that after haddiyyat, Syedna’s shehzadas would be assigned ‘alaamats that they would use in their correspondence. The ‘alaamat would generally be a verse from the Qur’an which would be placed at the top of the letterhead identifying the sender. The ‘alaamat given to Syedna Mohammed Burhanuddin by Syedna Taher Saifuddin was ‘Muhammadun Rasulullah’ (Mohammed is God’s messenger – Surat al-Fath, Aya 29). The verse clearly indicating what Syedna foresaw for his eldest son who was at that time not yet openly nominated as successor. The ‘alaamat given to Syedna Qutbuddin was ‘wa ma bikum min ni’matin fa minAllah’ (whatever ni’mat or grace you have, it is from God – Surat al-Nahl, Aya 53). The selection of the 53rd verse with the word ni’ma in it, which denotes walayat, demonstrates clearly Syedna Taher Saifuddin’s intentions. This intention was picked up on by people of knowledge at the time. Syedna Qutbuddin’s brother Shehzada Mohammed-ul-Baqir Bhaisaheb Jamaluddin gifted a handwritten manuscript to Syedna Qutbuddin. In the dedication of the gift he referred to Syedna Qutbuddin as the ‘greatest maula for whom people would do sajda’ and ‘for whom people would say na’am in the misaq’, because Syedna Taher Saifuddin had assigned him the ‘alaamat ‘wa ma bikum min ni’matin fa minAllah’. No action of Syedna Taher Saifuddin was coincidence, and, the assigning of this verse is a clear expression of the great khidmat that he foresaw for Syedna Qutbuddin. Syedna Taher Saifuddin personaly composed and transcribed a “misaal shareef” on 24thRabi’ al-Awwal 1380H (1960), Mumbai, to Syedna Qutbuddin. Syedna Qutbuddin (at that time Shehzada Khuzaima Bhaisaheb) was then in Udaipur, where two months earlier he had performed his first Ashara wa’az. Syedna Taher Saifuddin personally composed the misaal in classical Arabic, writing it out in his own hand. It is the only letter he ever wrote in this manner to any of his children. a. Syedna Taher Saifuddin states in the misaal that “you delivered sermons in Muharram in the first flush of youth, with God’s aid and a flowing stream of inspiration (ta’eed) from his chosen one, the Imam of the Age; and you performed outstandingly. May God, his Imam of the Age and his Dai accept your service.” Syedna Taher Saifuddin asserts that Syedna Qutbuddin received Imam’s inspiration (ta’eed); “ta’eed” is a weighty term, and is applied in Dawoodi Bohra doctrine only to the Dai. I bestow my salaam—a salaam whose minaret in the house of pure honor is elevated, whose soaring vistas in the horizons of authentic nobility are vast—upon you, my dearest, most precious, most radiant, most magnanimous, most devoted son, kaleja na tukra and joy of my heart, a bright luminary and an auspicious star in the firmament of high distinction, a hadd with a great destiny, one who walks the path of truest guidance, and has gathered in his heart the gems and pearls of haqiqat, one who shines in Da’wat-e Hadiya’s sky as a shining moon on the night of its fullness, and takes action appropriately through exemplary siyasat and considered judgment, whose name is Khuzaima and whose title is Qutbuddin. May Allah grant you a long life, keep you in his protection and safety, and regard you always with kindness and care. Your excellent letter, written with love and tafadi and adorned with exquisite pearls of shukr, arrived, as did many telegraphs [of shukr and acclaim from Udaipur mumeneen]. They gladdened me immeasurably, and I obtained qurrat-ul-ain by reading them. I offered praise and thanks to Allah Ta’ala for his unceasing favors, and gave thanks to Wali-Allah, Imam-uz-Zaman, who is the source of my victories and triumphs, for his great gifts and generous bequests. For you performed wa’az in Ashara Mubaraka, with Allah Ta’ala’s aid and the flowing stream of his Wali Imam-uz-Zaman’s ta’eed, in the first flush of youth, and you performed outstandingly. May Allah Ta’ala, his Imam-uz-Zaman and his Da’i accept your khidmat. After Ashara, you looked into Da’wat-e Hadiya matters and those of the jama’at, the jama’at of mumeneen, and you directed them beautifully. May Allah grant you favor upon favor, all these favors coming from Him and His Wali Imam-uz-Zaman. As for me: By the grace of Allah and the kindness of his Wali Imam-uz-Zaman (May Allah bestow His salaam upon him), I sleep and wake in the shade of Allah’s ni’mats. In all things, I follow the example of past Du’at Mutlaqeen, who themselves followed the example of their Imams, Imams for the people of taqwa, A’immat al-Muttaqeen, sailing and anchoring the ship of their Imams’ Da’wat in Allah’s name. Convey my salaam and du’a to the Ahl-e Wala of your town, those who are mukhleseen, sincere in their walayat. May Allah grant them countless barakaat, one following another, along with perfect felicity, and keep them safe and secure. Sent from Mumbai to Udaipur. In the last year before his demise, Syedna Taher Saifuddin went on a historic visit to East Africa. Many mumineen there had not seen a Dai in their lifetime, and this was indeed the first visit by a Dai to this land. Syedna Qutbuddin, who otherwise always remained with Syedna Taher Saifuddin wherever he travelled, this time stayed back in Mumbai for some days, in order to print a booklet with excerpts from Syedna Taher Saifuddin’s writings to present to mumineen in East Africa as tashreef. Syedna Taher Saifuddin was received in Nairobi by the British Governor General of East Africa Malcom Macdonald. From Nairobi Syedna Taher Saifuddin proceeded to Mombasa where he stayed for some time. From Mombasa he proceeded to Arusha where Syedna Qutbuddin joined him. The Mombasa jamaat came to Syedna Taher Saifuddin and did araz that since your Shahzada Khuzaima bhaisaheb was not present with you when you visited Mombasa, we would like for him to grace us with a visit now, so please grant us this wish. They were well aware, as were many mumineen, of the place this son of Syedna Taher Saifuddin held in his father’s eyes, and that Syedna Taher Saifuddin was not only showering this son of his with extra affection and favour, but was also preparing him, and indicating that he would rise to great heights in the khidmat of Dai and Imam uz-Zaman. Syedna acquiesced, and allowed Syedna Qutbuddin to proceed to Mombasa for a day. When Syedna Qutbuddin arrived in Mombasa he was received with much outpouring of affection from the community, with great fanfare, with a procession organized to receive him; the turnout, feeling and atmosphere was much like it had been when Syedna Taher Saifuddin had visited only a little while ago. There was a majlis in the masjid, and all the mumineen of Mombasa attended. They were deeply moved and touched by Syedna Qutbuddin’s bayaan. When he departed from Mombasa, the outpouring of love and affection for this beloved Shahzada of Syedna Taher Saifuddin was even more than when they received him. Some members of the Mombasa jamaat accompanied Syedna Qutbuddin back to Arusha. Arriving in the presence of Syedna Taher Saifuddin, they thanked him with great fervor for sending his beloved Shahzada, and recounted the events and highlights of the visit, saying “hamne emaj laagu ke Syedna Taher Saifuddin padhara chhe.” Syedna Taher Saifuddin was very pleased on hearing the report, and saidto them something that had deep meaning and significance, “Did I not tell you all that I would return [to your town] a second time.” (Mein kahyu thu ne ke mein biji waar aawiss) Just as Syedna Taher Saifuddin had said for Syedna Mohammad Burhanuddin, “This young man is me,” he said about Syedna Qutbuddin that he is me, I came to your town again, as I had promised. 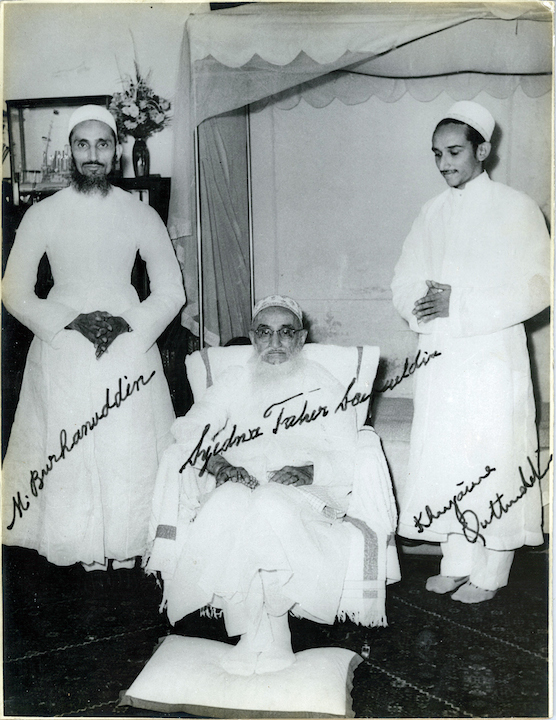 Syedna Taher SaifuddinRA had a historic photo of him with Syedna Burhanuddin and Syedna Qutbuddin on his side taken in 1382H (1962). Syedna Burhanuddin was at that time Syedna Taher Saifuddin’s Mazoon and his Mansoos, and he had hosted at his residence in Devdi Mubarak a ziyafat for Syedna Taher Saifuddin. The photographer, Shaikh Alihusain Lakdawala, photographed Syedna Taher Saifuddin with Syedna Mohammed Burhanuddin standing beside him. Then Syedna Taher Saifuddin instructed Shaikh Alihusain to find Shehzada Khuzaima Bhaisaheb and summon him, and waited almost ten minutes until he was located. When Shehzada Khuzaima Bhaisaheb arrived, Syedna Taher Saifuddin directed Syedna Mohammed Burhanuddin to stand at his right, and Shehzada Khuzaima Bhaisaheb to stand at his left, and told Shaikh Alihusain to take a second photograph. This photo, and the conscious effort to have it taken, is a testimony to what Syedna Taher Saifuddin clearly foresaw for his two sons Syedna Mohammed Burhanuddin and Syedna Qutbuddin in the khidmat of Dawat. This picture was not a coincidence. Syedna Taher Saifuddin summoned Syedna Qutbuddin and waited for ten minutes. He could have also summoned any other, or all, of the brothers in Surat. He did not.